I started playing golf in the mid 1990’s. That’s around the same time the young Tiger Woods turned pro. He rose to the top of the world ranking in June 1997 making the fastest-ever ascent to no. 1. And looking at the most recent world ranking from last week – he is still on top. Maybe more than anyone else, he has had his ups and downs during the years, but there he is again at number one. Watching the Major tournaments this season has gotten me thinking about the age structure of the top shots of professional golf. At British Open the 49-year-old Miguel Angel Jimenez – whose trademark cigar I remember already from my childhood – was in the early lead. 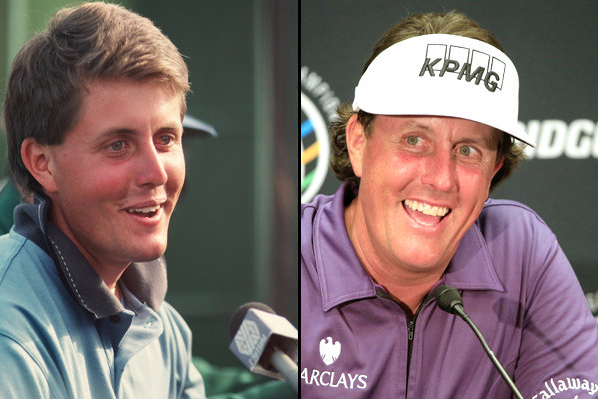 At the end it was Phil Mickelson who took the victory – also in his 40’s and a childhood hero of mine. Back in 1997 when Tiger first became number one on the rankings the best tennis player in the world was Pete Sampras. The alpine skiing world was dominated by Hermann Maier of Austria and Lasse Kjus from Sweden. Ice-hockey fans rooted for guys like Mario Lemieux, Mark Messier and Pavel Bure. And the FIFA World Player of the Year award went to Ronaldo. You don’t see much of these guys in action anymore. Well, there is a Ronaldo among the best football players in the world but he has a first name and it’s Christiano. Sampras, now 43, ended his career in 2003. Hermann Maier, also known as the Herminator, retired in 2009 when he was 36 years old. Also Lemieux, Messier, Bure and Ronaldo are yesterdays stars. But if you look at the golf world ranking from this time of the year in 1997 there are other names besides Woods (now 37) that are still today competing for top spots in the big tournaments – at least occasionally. Names like Phil Mickelson (40), Vijay Singh (50), Ernie Els (43) and Colin Montgomerie (50) are just as familiar to golf fans today as they were almost 20 years ago. And before them some legends of the game like Nicklaus, Player and Palmer were still playing events well into their 70’s. Vijay Singh holds the record for most wins on the PGA Tour after age 40. He has actually won almost twice as many times after reaching 40 than before it. Vijay Singh at a young age (left) and recently. He has won almost twice as many times after reaching 40 than before it. The future of golf probably doesn’t lie on the shoulders of the professionals past age 40. There are younger players on the top as well. But if for example Rory McIlroy and Rickie Fowler (who both are in their mid twenties) will play for as long as the legendary Jack Nicklaus did, they will still be turning up in Major tournaments in the year 2050. Of course there are examples of athletes being successful on the top level still in their 40’s in other sports as well. One that is especially close to our hearts here at GameBook is our ambassador Teemu Selänne. Teemu, now 43, is currently considering the future of his NHL-career that has already lasted over 20 years. And no matter what Teemu ends up deciding in terms of hockey, he’ll surely have a long and bright future ahead of him on the golf course.